Are you playing it too safe, IT leaders? Take these InformationWeek 500 projects along to rev up your next brainstorming session. Read more. From mobile apps to test beds on wheels, creative thinkers at government agencies are finding ways to better serve the public. Read more. Among 10 IT teams transforming parts of the U.S. healthcare system, you'll find important lessons in innovation and persistence. Read more. Benchmark your company's technology strategies and practices against the country's leading organizations, gain national recognition for your business technology team, and be seen by investors, customers and business partners as a technology innovator. InformationWeek will be identifying and honoring the nation's most innovative users of business technology with its 2013 InformationWeek 500 listing. Now in its 25th year, the InformationWeek 500 tracks the technology, strategies, investments and administrative practices of some of the best-known organizations in the country. This year, we are expanding the program to include higher education. Pre-register now to qualify and receive information on the application process. The application period closes April 12, 2013. 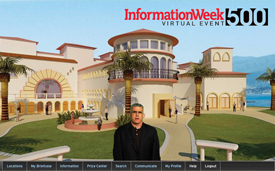 For information on the InformationWeek 500, email [email protected]. Get the complete scoop on the 2012 InformationWeek 500, including our cover story, winner profiles, our complete list of winners, and more.